Harold Goodman died of wounds on 3 May 1917, during the Battle of Arras. He is commemorated at the Arras Memorial. Harold was born early in January 1893 and baptised on 11 January, in West Auckland. He was the eldest son and third of five children of William and Agnes Goodman (nee Proctor). Two other children died. William had been innkeeper of the Eden Arms in West Auckland. By 1911, the family were living in Darlington and William was now a hotel waiter. Harold had left school and was apprenticed as a grocer’s assistant. He was unmarried. The Durham Light Infantry (DLI) had recruited continually since War was declared. The 18th Battalion was formed on 9 September 1914 in County Durham to encourage groups of friends or workmates to sign up in what were called Pals Battalions. Recruitment had been slow after the euphoria of the first months but the sinking of the Lusitania on 7 May 1915 had rekindled a feeling of patriotism. There were training camps in the town, principally at Hummersknott but also further afield at Hartlepool, then at Cramlington and Ripon. Harold passed his training as “Very Good” in Drill and Bayonet Practice as well as other disciplines. He was promoted to Lance Corporal on 10 October 1915 and to Corporal on 18 May 1916. The Pals were part of the 93rd Brigade of the Army. In December 1915 the Battalion sailed from Liverpool to Egypt. The Troops landed at Port Said on Christmas Day 1915 and were to defend the Suez Canal. 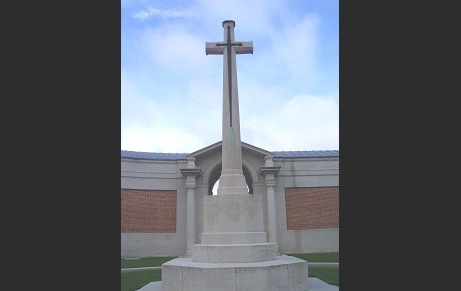 Harold was killed in action and his name appears on the Arras Memorial in Bay 18. Harold and his brother, Amos, are remembered on the headstone of his parents in Darlington West Cemetery. However, the surrounding bushes have now grown so high and thick that it is impossible to photograph the grave. Their names are on Panel 3 of the tablets in the Entrance Hall of the Administrative Building of the War Memorial Hospital now Darlington Memorial Hospital and on the Triptych in St John’s Church. On 25 September an order from the War Office to the Officer in Charge (Infantry), York instructed him to send Harold’s personal belongings to William Goodman, his father. Eight months later William was requested to prove identity in order that Harold’s Plaque and Scroll be sent to the family. Finally, William acknowledged a sum paid in respect of Harold’s service. Harold was awarded the Victory Medal, the British War Medal and the 1915 Star – known as “Pip Squeak and Wilfred”. Harold had a younger brother Amos, the second son and fourth child of William and Agnes. He became a Gunner with the Royal Horse Artillery and the Royal Field Artillery. Amos died of wounds on 29 April 1918 and is commemorated at Lijsssenthoek Military Cemetery.